Segrest Farms: Should I Drip Acclimate My Fish? We all want to keep our fish as healthy as possible, and so we develop certain habits to help with this. We perform routine aquarium maintenance to prevent a buildup of harmful substances. We carefully consider tankmates in order to reduce aggression. We use quarantine tanks to monitor new arrivals and avoid introducing sick fish to a healthy tank. We make every effort possible to keep our water parameters stable and avoid pH swings. Most methods of keeping our tanks healthy revolve around one concept: trying to reduce the amount of stress our fish are exposed to. Like people, fish have robust immune systems. Also like people, when they come under stress, fish’s immune systems can become suppressed, allowing pathogens that would normally be fought off to overwhelm the fish. By keeping our fish comfortable and happy, they are less likely to become ill.
One of the most stressful time periods for any aquarium fish is when it is bagged up and moved to a different tank. 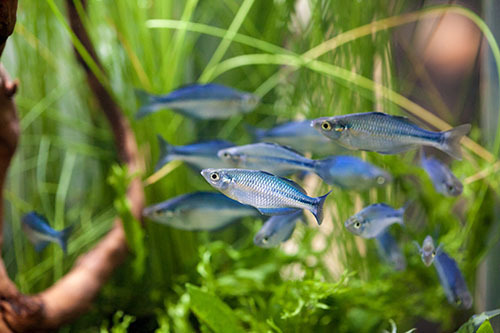 There have been many acclimation methods developed in an effort to reduce the fish’s stress during this time period, and one particularly popular method is drip acclimation. This leads to a question that all aquarists should be asking themselves: should you be drip acclimating your fish? The underlying philosophy behind drip acclimation is that you want to avoid the stress that happens when fish are suddenly moved from water with one set of parameters to water that is completely different. While fish can be remarkably adaptable, sudden changes in temperature, pH, or hardness can be hard for them to deal with. When drip acclimating, you start off by putting your fish (and the water they were bagged in) into some sort of container or bucket. Using a narrow tube (such as an air hose), you start a siphon to pull water from your aquarium into the bucket. You can tie a few knots into the tubing or use some sort of check valve to slow the flow down to only a few drops per second. As you introduce tank water into the container, you occasionally remove some of the water from the container as well. Alternatively, there’s a faster variation where instead of a steady drip, you’ll use a cup to periodically add and remove water from the container. The idea is that you are slowly replacing the water that the fish were shipped in with water from your aquarium, which allows them to gradually adjust to your aquarium’s water. Ideally, the entire process should take a few hours. Before you decide this is the perfect acclimation method, you need to also understand what the fish experiences while it is bagged up before reaching your house. What Happens in The Fish Bag? Ignoring the potential challenges around the fish physically getting moved (such as the bag possibly getting bounced around and being exposed to a wide range of temperatures), there are two primary actions going on inside the fish bag. The first is that the fish is breathing. It’s taking oxygen in from the water and exhaling carbon dioxide. Unless the fish is in the bag for an extraordinarily long amount of time, this isn’t really a problem. If it’s bagged with ambient air, there’s enough oxygen for at least several hours. If pure oxygen is used to inflate the bag, there will be enough oxygen for several days or more. But, the increase in carbon dioxide does have another affect. As the extra carbon dioxide is absorbed into the water, it forms carbonic acid. This leads to the pH in the bag dropping, sometimes to an extreme degree. For example, it’s not uncommon for us to receive marine fish that are bagged in water that is quite hard and alkaline to arrive with their pH being at 6.0 or below. The second process is that the fish will be continuing their natural bodily functions, which ultimately result in them producing (and releasing) ammonia. As a hobbyist, you should already know that ammonia is highly toxic. But this is also an incomplete picture. Depending on the pH of your water, you might have ammonia, ammonium, or a combination of both. The higher the pH, the more ammonia you will have, while in lower pH environments it will be converted to ammonium. It turns out that only ammonia is highly toxic, while ammonium is actually relatively harmless. Luckily for us, these two processes result in a good thing for us. As the carbon dioxide pushes the pH of the water lower, the ammonia being produced is converted into ammonium, offering some protection for the fish and preventing them from poisoning themselves. This brings us to some problems with drip acclimation. The biggest, most readily apparent problem, is what happens with all of that ammonium during the acclimation process. While you are slowly removing the old water during drip acclimation, you are also probably going to be raising the pH of the water fairly rapidly. Simply exposing the water to the atmosphere will lead to the dissolved carbon dioxide dissipating from the water and the pH returning to normal. Simultaneously, if your aquarium has alkaline, fairly hard water, you are going to be introducing buffering agents that will raise the pH of the water. As the pH raises, all of that ammonium is going to be converted back into ammonia, which is bad for the fish. The damage that high ammonia concentrations can cause has the potential to be much worse than what the stress of introduction can do to the fish. Are There Benefits to Drip Acclimation? There is a seemingly obvious benefit of drip acclimation in that it does allow you to more gradually transition the fish from the environment it was living in to the environment of your aquarium. And, as we’ve already discussed, a more gradual transition should be less stressful for the fish. In reality, the benefit is going to be fairly modest. If your aquarium is already fairly close in water parameters to where the fish came from (say, for example, a 0.5 pH change or a salinity that is only a couple of points away), then a slightly longer acclimation may in fact be beneficial. However, for significant changes in water parameters, it can takes weeks, or even a month or more, for a fish to truly acclimate to its new conditions. A few hours of drip acclimation is going to make little difference at all. Like so many things, the answer to this question is: maybe. If you are just taking your fish home from the store and it’s only been in the bag for an hour or two (or less), then there probably hasn’t been enough time for dangerous levels of ammonia to build up. In that case, there’s probably little harm and potential benefits to drip acclimation. If the water in your aquarium is very soft and acidic (for example, you’re running a blackwater biotope), then the pH will probably never get high enough for the ammonium to convert to ammonia, reducing that risk even if the fish have been in the bag for a while. However, if you are a retailer ordering from a distant wholesaler or a hobbyist ordering from online sources where your fish have been bagged up and shipped for an extended period of time, you want to very carefully consider whether drip acclimation is a good choice. In these situations, we believe that getting your fish into clean water as quickly as possible is more important than trying to give your fish a gradual introduction to your tank. Ultimately, whether or not you want to drip acclimate your fish is a decision that is left up to you. Whatever acclimation method you choose, unless the fish are in extreme distress (such as if several have died during transit) and need to be released immediately, it is important to start out with a temperature acclimation. Temperature shocks can cause significant problems for fish. Float the bag in the tank for 10 to 15 minutes to let the water temperature in the bag adjust to match the tank. Once the temperature has adjusted, proceed to whatever release method you choose, whether it is dripping first or releasing straight to your aquarium. The absolute best acclimation method is to set up a quarantine tank whose parameters match your source’s. Note that the goal is to match the conditions that they have already acclimated to and been living in, not the conditions within their shipping bag. Try to get the pH, hardness, salinity (if it’s a marine tank), and temperature as close as possible to the values your supplier kept the fish in. Then, simply drain the water from the bag (but not into your aquarium) and release the fish into quarantine. Using this method, you can, over the course of two to four weeks, slowly adjust the parameters to match your main display aquarium to prepare your fish for that move. In a quarantine, you can gradually acclimate your fish and monitor them for any other problems all at the same time. How do you acclimate your fish when you bring them home? This entry was posted on September 26, 2017 at 6:57 PM and has received 5541 views. There are currently 1 comments. Print this entry.